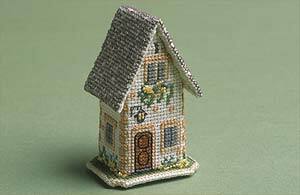 Tiny cottages to give you a taste of three dimensional cross stitch. Designed to look like cottages from popular holiday areas, they are ideal projects to take on a break, and will probably take little more than a weekend to complete. The finished size is approximately 2½" (6.5 cms) high, and the kit contains 18-count aida, stranded cotton, felt, plastic canvas, needle, chart and full instructions. A stone cottage with spring blossom around the walls.